As recirculating aquaculture systems (RAS) operate by reusing the fish tank water it is essential to control the water quality. Many studies show that treating RAS systems with ozone increases productivity as fish health and survival is increased. At RAS the organic load tends to be high and the homogeneous fish stock leads to a high risk of infections and problems with bacteria, fungi, and viruses. Although ozone is not primarily used for disinfection at RAS the reduction of solids and DOC often creates an environment that is less favorable for bacterial growth and thus creates a reduced need for disinfection. Ozone changes the characteristics of the dissolved organic compounds (DOC) by oxidation and precipitation which makes it easier to remove the DOC by biofiltration and sedimentation. To find out more about how ozone increases productivity in RAS, please read our article published in Global Aquaculture Advocate and FishFarmer Magazine. 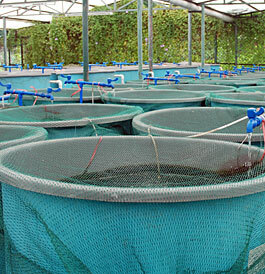 At the Freshwater Institute, WV, USA, they are convinced that ozone water treatment is essential to optimize production in water recirculating aquaculture systems (RAS). Scientists at the Freshwater Institute have been studying ozonation for years but have never before used such a sophisticated ozone generator as the Primozone® GM ozone generator.